Interview with our new partner! As previously announced, we started some new partnerships that will help our authors to reach the Italian market once their book is translated. Here it is the first interview, with Lucia & É Scrivere. You will find what they can do for you and some tips to have success on the Italian market. Enjoy! Hello Lucia and thank you for agreeing to this interview. Could you tell our readers a little about yourself and what you do? I love books and have made a career out of my passion. I have a degree in linguistics, specialising in German and romance languages and I taught Italian and German to foreigners for several years. Then I discovered my passion for writing and have since entered the world of publishing. I worked for a publisher and in 2013, I founded, along with some colleagues from È scrivere – Community for Writers,a collective of freelancers, which offers editing, design and promotion services, namely the Editorial Services of escrivere.com. Then, since the beginning of this year I developed my own personal brand: LCS – Editing, translation and literary promotion. A little later, LED also came about. At The Italian Bridge, I deal with promotion services and the press office. I am delighted with this partnership! What is È scrivere and how does it help writers? È scrivere is a portal dedicated to writing, reading and editing. It has a blog featuring countless articles on various narrative techniques and interviews with both editorial professionals and local and international authors. It also has a page offering editorial services, which an author can rely upon for professional treatment of their text. There is also a Facebook group that allows authors to advertise their own books, to ask for help and information and to put themselves on the line by posting extracts that can then be commented upon by other users. We have always depended on everyone’s collaboration. And from this collaboration between administrators and users, two anthologies of short stories and the ESC series were born. All of our e-books can be downloaded for free from major online stores. We also provide a marketing service to authors who have already published their work, because often writers do not have the time to advertise their own book or they don’t know where to start. That’s where I come into play. Speaking of writers, in your experience, what’s the secret for advertising your own book and reaching as many readers as possible? If the author isn’t present on social networks, it will be difficult for their book to reach a lot of people/buyers/readers. Even if they publish their book using a small publishing house, they can’t be sure that the book will be promoted and often find themselves left to their own devices, with no idea about where to start. 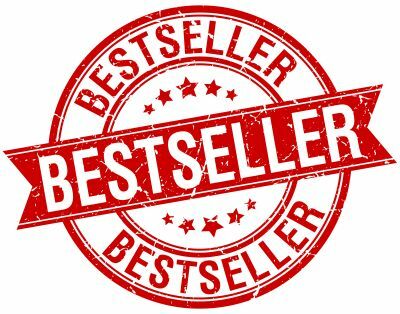 I don’t think that there is one secret.It’s necessary to be active on several levels to get results, not necessarily bestsellers, but to get regular sales and most importantly, to not be forgotten. So, if I had one piece of advice, it would be to not focus on “everything all at once”, but to think of a marketing strategy that, after the initial boom in sales generated by the book launch, manages to maintain attention in the following months, ensuring balanced and regular sales. There are loads of other aspects to consider, but we can sum up by saying that you need the right mix of elements: the author’s commitment, the presence on social media, the quality of the product (this is fundamental), a long-term sales strategy and a good dose of luck, which never hurts! I should add that collaborating with book bloggers is not to be underestimated, as is often the case. They are the first to give authors visibility. And what’s the mistake to be avoided? Answering bad reviews by accusing the reader of being ignorant. And, most importantly, putting a poor-quality book on the market. The text has to be worked on professionally, full stop. Our writers are mainly American; what advice would you give a foreign writer who wants to break into the Italian publishing market? To look around, to study the part of the publishing market that interests them and to reach out to various actors in that sector (such as publishing houses, literary translation agencies, influencers, bloggers, top Amazon reviewers). If they can’t do it themselves because of the language, the best thing to do is contact one or more professionals right away. That’s what we’re here for after all! The Italian Bridge has started a valuable partnership with you and È scrivere; could you tell us a little about what you can do for our writers after they have had their work translated into Italian? Ideally, they would entrust me with the promotion of their book before it gets published (although this isn’t absolutely necessary). That way, I would have the time to draw up a plan of action and to discuss it with the author (don’t worry, I speak English!). Based on the promotional package chosen (I offer several options from simple press office to shared management of the Facebook page), we set a promotional calendar together. Meanwhile, I prepare the press release, which I send to bloggers that I work with, selecting those who might be interested in the book, of course. I ask them to do recommendations (book presentations), reviews, interviews or giveaways. Again, depending on the package chosen, I organise one or more events, which take place on blogs and on social networks, to enhance the visibility of the book. Or I take care of sharing reviews and recommendations on the author’s page. Promotion is “couple’s work”. Yes, the authors entrust me with their book, but I’m always by their side and I need them to work with me to create the best possible promotional plan. To get an idea of my experience and the projects that I’ve worked on, you’re welcome to browse my portfolio and reviews of my work. You can also find events that I’ve organised on my Facebook page, under “Events”. Thanks for agreeing to this interview with us! The same happens for all languages: PROVERBS are often difficult to guess unless we don't know the actual meaning of them. Here you can find the top 5 Italian proverbs! Literal meaning: the one who do something by himself, does what 3 people could do. English version: if you want something done well, do it yourself. After the great success of our article Italian Men: more than just a stereotype it's time to dedicate some lines to the Italian women. 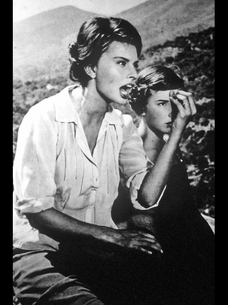 If you have ever watched an Italian movie, you know how Italian women look like: strong, jealous, passionate, mothers. In a word, Italian women are a Tornado. And since the only chance to survive is to try to know them as soon as possible, here you will find some suggestions that could help you dealing with them. All you should know to make this proverb real. New Year's Eve is almost here and Italy is ready to party for the Capodanno or Notte di San Silvestro. As you can imagine a MAGNIFICENT dinner is what makes our night special and, as always, we have so many ways to ask the GOOD SPIRITS to help us beginning the new Year in the right way, and most of all, HAVE A RICH NEW YEAR. So, once again, here is all you should do to make the 2014 the most lucky of you life! MANGIA!!! How to survive to the Italian Motto. There is one word that is worldwide known, and that is a kind of motto for the Italian expats and it's MANGIA. 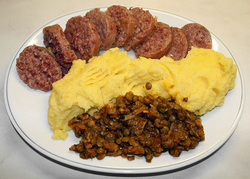 MANGIA (Eat) is Italian Mothers' and Grandmothers' favorite word. That you are eating like a little bird, or like a hoover, it doesn't matter. When you sit at an Italian table, you will hear this word at least one time (if you're lucky). Many think it's just because our mothers love us, or because they always see us like a child in need to grow up, or because of our sense of hospitality.